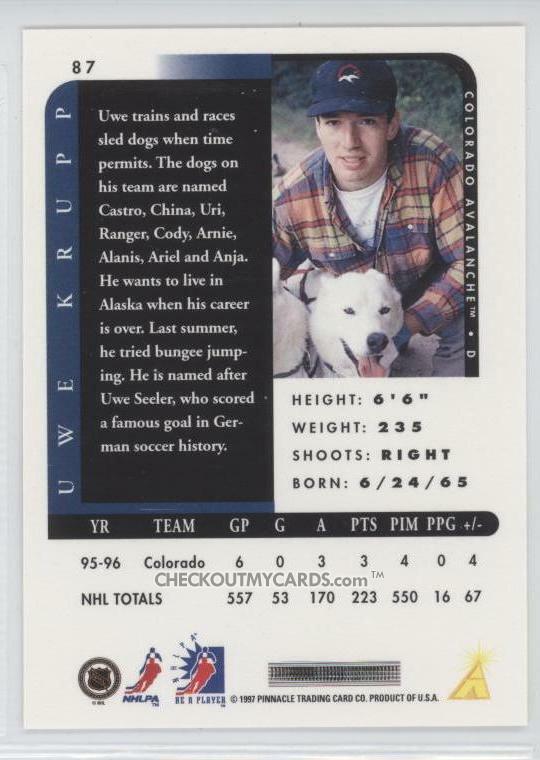 There are many great hockey card sets out there, but one of our favourites is the 1992-93 Pinnacle Sidelines subset that profiled nine NHLers and some of their off-ice hobbies. 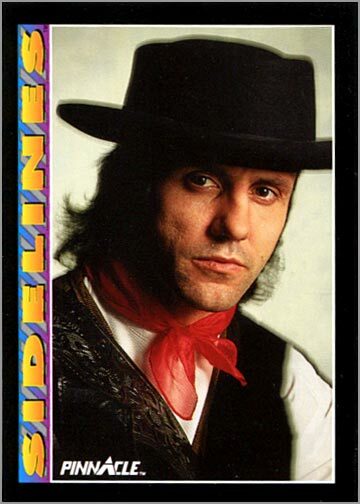 Part One was great featuring Eric Lindros, Randy Wood, and Dale Hunter, and Part Two didn't disappoint either with Pat Falloon on a tractor, Luke Richardson playing with model rockets and Dean Kennedy as a rodeo star. 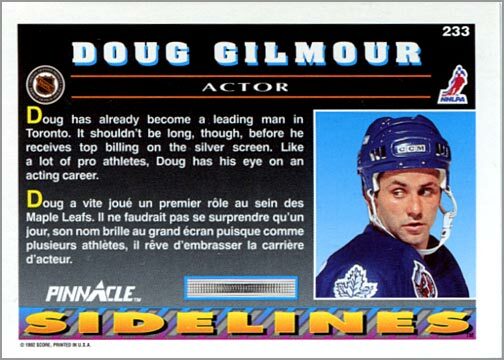 We've already written about Doug Gilmour's hilarious collection of hockey cards, and this one is among the best. I don't know about you, but when I think of someone being an "actor" I don't think of them dressed up as a cowboy. Dougie would pop up in TV shows from time to time, but we're glad he stuck to hockey and earned a spot in the Hockey Hall of Fame. 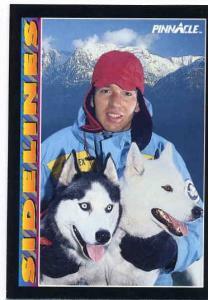 While we couldn't track down the back of Krupp's 92-93 Sidelines card, he would pose with his huskies again in the 1996-97 Pinnacle's Be A Player series as he is an avid dog sledder. We're going to assume that Krupp's favourite movie is Iron Will, and we offer him this advice: keep those dogs away from Bryzgalov! We were lucky to track down Cam Neely's card in this set, but were unable to find the back of it with a description. 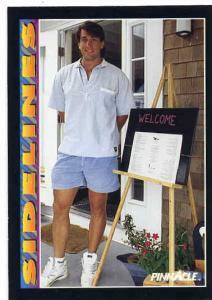 We did find out that Neely wanted to be a restaurant owner so that explains him standing awkwardly in front of a menu. Seabass would be quite scary in the restaurant business, and you'd have to make sure to never toss salt over your shoulder when he's around. 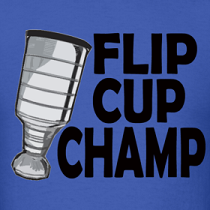 I have that Cam Neely one, I'll try and scan the back for you guys! Does anyone even collect cards anymore?